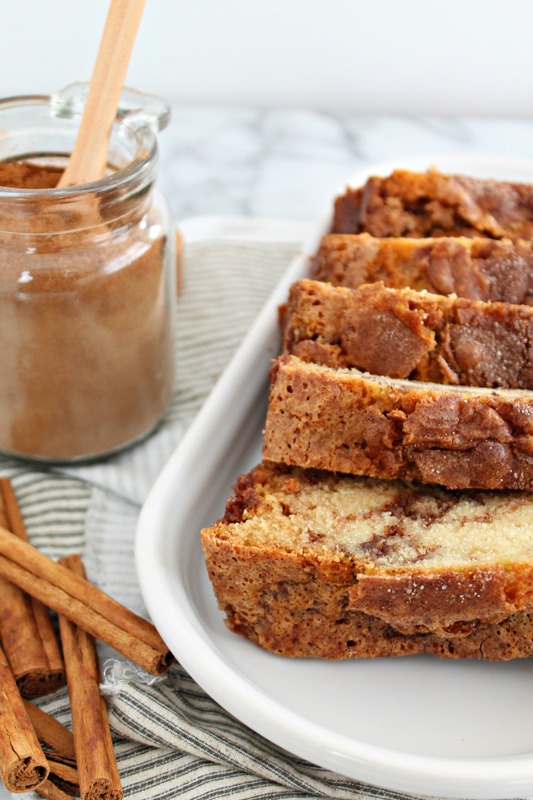 What is it about the combination of cinnamon and sugar that makes all things incredible? Bake up this delicious Cinnamon Sugar Loaf Cake – it reminds me of crispy churros dusted in light cinnamon sugar, without the greasy deep frying! Quick breads are one of my favorite things to bake for two reasons: they are just like their name – super quick to make & they make great gifts! So when brainstorming ideas for a new quick bread, I remembered that after cleaning my spice cabinet I had about four bottles of ground cinnamon and needed to start using it. That’s how this Cinnamon Sugar Loaf Cake came about – plus my love for anything with the spiced sugary blend tends to be my favorite! You see that crispy top layer? 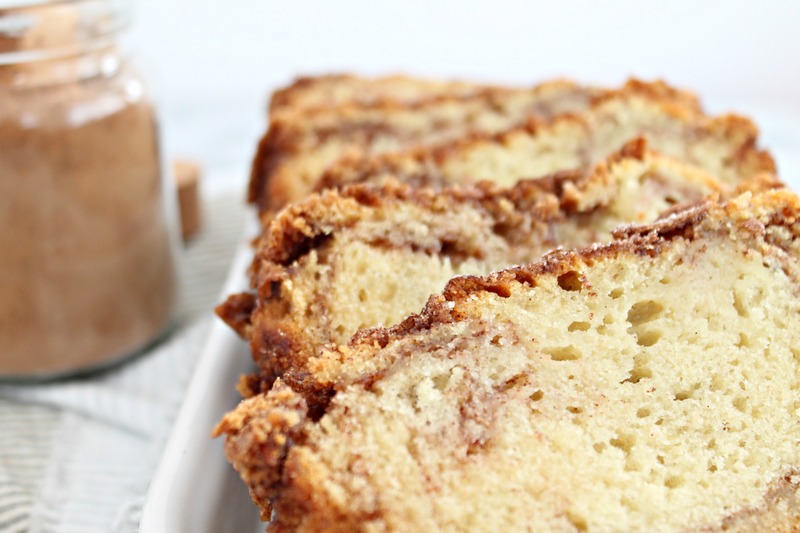 It’s the result of layering extra cinnamon sugar and swirling it over the top with a knife – this bread is moist in the center with a crunchy sugar topping – but also includes a swirl of spiced sugar in the center, for extra deliciousness! the recipe calls for buttermilk, but if you don’t have any at home, just add the juice of a lemon or lime to the cup of milk – super simple and you’ll be baking up a loaf of this in no time. Better yet, why not double this recipe and freeze a loaf for later. Go forth and bake! This Cinnamon Sugar Cake is reminiscent of fried dough at the fair, crispy churros dusted in spiced sugar, and all the great things in life! Preheat oven to 350F and grease a loaf pan, set aside. In a large bowl, whisk all the dry ingredients together and add the buttermilk, egg, and oil. Pour half the batter into loaf pan and sprinkle enough cinnamon sugar to coat the top. Pour the rest of the batter on top, sprinkle more sugar to coat top. Using a knife, swirl the batter with the cinnamon sugar, like making figure 8's. Bake for 45-55 minutes, until toothpick comes out clean. Oh, my, this looks so good! I’d love a piece for breakfast today…and lunch…and dinner…!